In fact, it was. 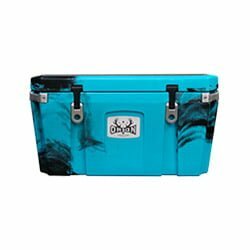 If you are looking for a cooler as tough as you are and one that can withstand the outside elements, WHILE still able to keep its contents fresh and cold then you’ll want to check out this Canyon Cooler review. The original Canyon Cooler was designed to be able to take on the Grand Canyon for weeks at a time. These adventures took travelers into the Canyon and called for a cooler that could keep its contents fresh for two weeks, while doing battle with the triple digit temperatures. In fact, that’s where we’ll start – it’s build. To start with a cooler of this magnitude, you’ll need to ensure that the process involves a seamless and near-perfect design platform. How does Canyon achieve this? Simple, here’s how: Roto-Molded PE Construction. This means that the entire wall of the cooler is cut EXACTLY the same which yields the best ice retention times and durability across the board. The wall itself is cut to 2.7 inches, providing more than ample thickness to keep its contents colder for longer periods of time. 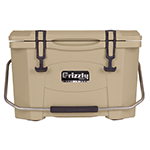 These coolers are also Grizzly Bear certified by the Grizzly Bear Committee, which means that they are safe for them should they decide to try and take them apart. Note we said TRY, because that’s what they’ll need to do. If you are a one-man gang or someone that travels in a pack, you’ll be delighted to know that the Canyon ice coolers come in a wide variety of sizes and models. Here’s a look at the various models available and their sizes. Need something a little bigger? At 35” x 20.25” x 20.25” you’ll find the biggest of them all in the Outfitter 125.
Who Is The Canyon Ice Chest For? While the Canyon is a great cooler for any occasion, you really ought to think about what you will be using the cooler for. For example, if you will need a cooler for a potluck or party, then you may want to check out our soft cooler guide or best beach cooler guide. 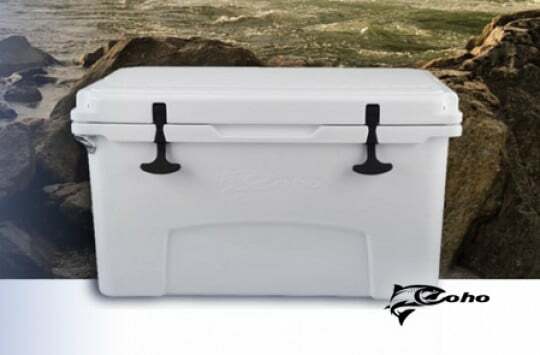 However, if you are looking for something that can stand up to the rugged outdoors, withstand extreme temperatures and still keep your contents fresh and cold for days on end, then you may want to look into the Canyon Ice chest as your cooler of choice. On average, Canyon Coolers can keep ice frozen for 5-14 days depending on the variables you put it through. A user called the Canyon as good as his Yeti cooler. The user didn’t like the shoulder strap but did say it performed well and was extremely impressed with the price point, especially for the quality that you get with the Canyon. One user who left an extensive Canyon cooler review called these coolers Awesome. After in depth research and comparisons of nearly 10 of the top coolers on the market, they choose the Canyon Ice Chest. The user even updated the review and said it was still working as advertised with no issues. 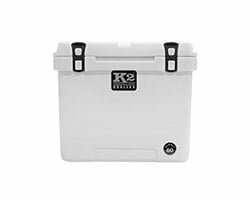 Another user said it was a great value for the price and found it to be similar to his Yeti cooler, just much cheaper at half the price. Which leads us nicely into the next section. 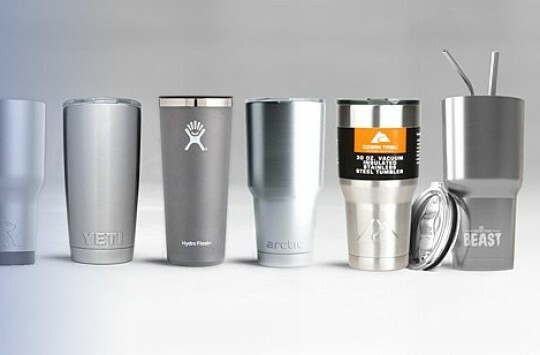 Canyon Coolers Vs Yeti: Which Is Better? 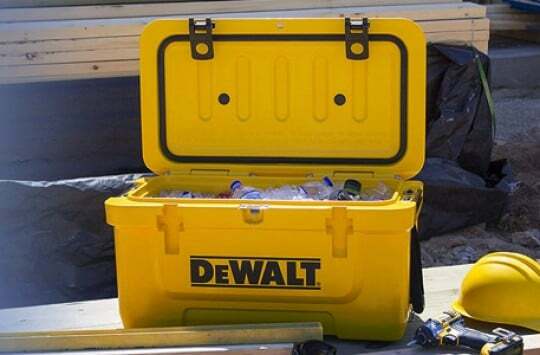 When you are looking at coolers, their durability, quality and cost, oftentimes the discussions turn from what you are thinking of buying, as compared to some of the leading coolers on the market. You asked, so we are going to answer. When we reviewed the Canyon alongside the Yeti Tundra or Yeti Roadie, many comparisons can be made as far as build, ice retention times and other special features. While it can come down to the little things such as capacity and things of that nature, what really helps to make the decision easier for us is the cost. Wall Thickness 2.7" Wall Thickness 2"
The simple fact of the matter is it comes down to cost. While the choice is still up to you, and we do hope that our Canyon cooler review has helped to give you a better idea, when it comes to value for your money we are going to choose the Canyon Ice Chest over the Yeti. 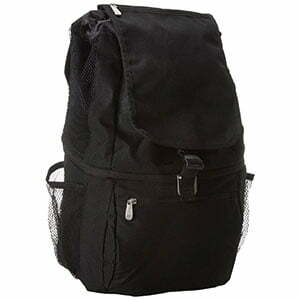 Where To Buy Canyon Coolers? 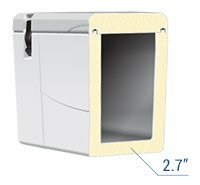 You can purchase one of the coolers from the manufacturer’s website, or can even check to see if there is a dealer location close to you to pick one up from. If you are looking to get the best deal however, then you will want to check Amazon as there are a wide variety of Canyon Coolers that can be found there at various price points that can suit your needs. So, should you buy one? That answer is really up to you, but we do hope that this Canyon Cooler Review helped to shed some light on that decision. If you need something tough, durable and comparable to some of the top named coolers on the market at a far cheaper price, then you may want to give the Canyon ice chest a second look. I purchased a Canyon 55 and accidentally left it in my truck in in the hot sun Texas for about a week; only one latch clasped. The lid warped slightly as could possibly be expected with this or any similar material. Within a week I had a new cooler. No questions, no shipping, handling or exchange fees. Just free as advertised. Exceptional customer service in the process. Snap. As to the capability. Compared to a similar Yeti. Canyon won the ice bag test.